Many of the earrings that the Duchess of Cambridge wears for evening events -- like the Queen Mother's sapphire fringe earrings, the Queen's diamond chandelier earrings, or her own diamond and emerald earrings -- are set with precious stones. But today's earrings, the "Eva" earrings from a brand called Beaut, are affordable pieces that many could add to their personal collections. The earrings, which are meant to echo the art deco jewels of the 1920s, are a part of Beaut's vintage line. The earrings were sold exclusively through Jenny Packham, a designer whose dresses Kate has worn frequently. Made of sterling silver and set with paste stones, the earrings are the brand's "Eva" style. They can now be purchased through Beaut's website for around $250. 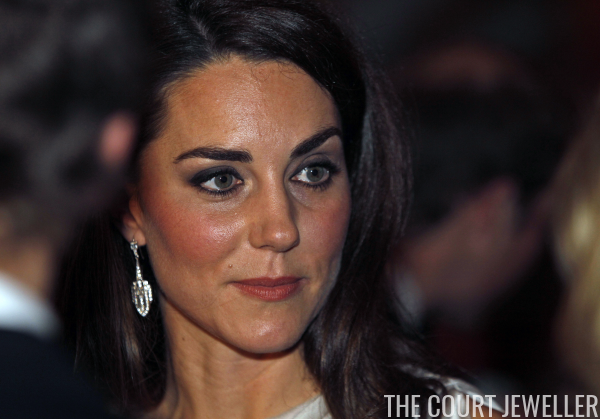 Kate wore the earrings for the first time in public in November 2011 at a reception at St. James's Palace for the National Memorial Arboretum Appeal. Appropriately, she paired them on that occasion with a gown by Jenny Packham. A second outing in the earrings, which took place in May 2012, was at the Thirty Club in Mayfair. For that event (pictured above), she wore the earrings with a gown by Roland Mouret. The earrings are a good example of the variety of pieces in Kate's jewelry box, ranging from jewels that can be acquired easily by many people to precious pieces with impressive royal histories.